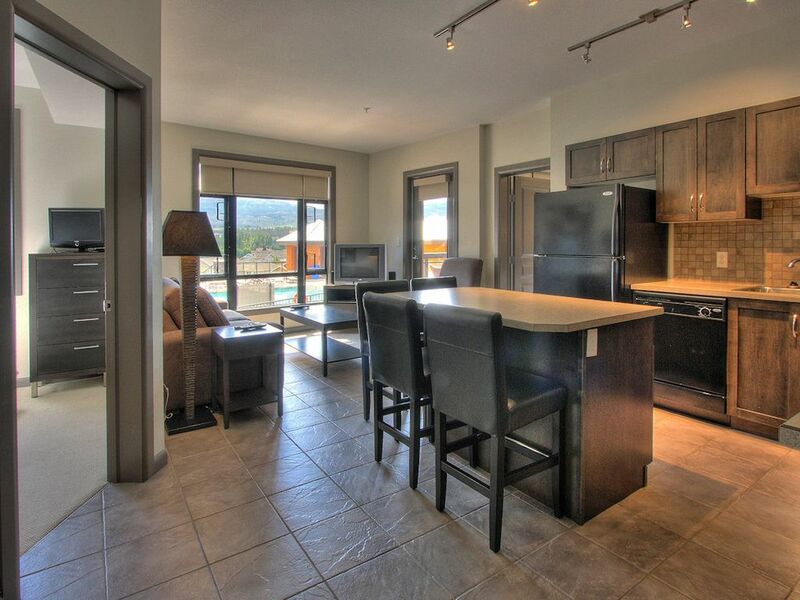 This lovely 2 bedrooom, 2 bathroom condo overlooks the pool with a southwestern view over the vineyards and mountains. The 'California split' layout has one bedroom and one full bathroom on either side of the kitchen / living area, well suited for two couples or families with children. Playa is only 200 metres to Rotary Beach, one of Kelowna's favorite family beaches. The complex has a restaurant and coffee shop, and is well connected to biking and walking paths. Playa Del Sol is Kelowna's finest 4 star, year round resort in the heart of the Okanagan Valley. Just a few steps to Okanagan Lake. This unit is a 'California Split' layout, with a bedroom and full bathroom on each side of the living room, each with southeast facing windows overlooking the pool, orchards of southeast Kelowna and the South Slopes. Playa del Sol is only 400 metres from Rotary Beach, with swimming, boating and playgrounds. It is 500 metres from the Mission Creek Linear Park, offering over 10 kilometres of walking and biking trails. Just minutes from Playa Del Sol are some world renowned golf courses, ski resorts, wineries, water sports, fishing, hiking and mountain biking. In addition, Playa is 5 minutes from the Mission Recreation Park, complete with the Capital News Centre Sports Arena and the H20 Centre Water Sports Centre. Playa is the perfect spot to stay with your family during a soccer or football tournament, or for swimming meets and skating events. Playa De Sol is an energetic, fun, family environment that allows you to relax after exploring the Okanagan. Amenities include a fully equipped fitness centre, pool and hot tub, a view that overlooks the pool side courtyard, coffee shop, restaurant and bar at the ground level. - The parking accommodates one vehicle underground - height restriction of 6'8". One visitor parking is available. Please contact owner if required. - all the house hold appliances such as 4 slice toaster, blender, microwave and mix master. - all dishes, glass wear, cutlery and utensils. - clean filtered drinking water on tap. - two fully equipped washrooms with a shower in each one and one with a bathtub. Hair dryers supplied. * Fresh clean linens including luxury sheets, all towels and dish clothes. * 24 hour security and a property manager always ready for your questions and concerns. * Fully equipped kitchen with extra supplies to allow you to just buy the food. * Your own balcony to enjoy your breakfast, lunch, dinner or just use to relax on. * Your own full size natural gas BBQ on the balcony. * Owners who know the area and can provide assistance in making your trip legendary! Note that the unit is appropriate for a maximum of occupancy of 4. My husband and I are both from the Okanagan valley. After touring through most of Europe with our kids a year prior and staying at a variety of apartments, condos and hotels we recorded what we liked about each one and what thoughtful touches we could bring for couples and families travelling to the Okanagan. The Okanagan is really is one of the greatest spots in the world with wonderful dry and warm weather, wonderful views, great food of all cultures, wine and produce, and the best access and availability of outdoor recreation from winter skiing to water skiing. We selected this property as it has wonderful light from the south east facing windows and a wonderful view from the pool deck to the mountains in the back ground. The condo is very nicely laid out, good for two sets of couples or families with kids. It is across the street from a boat launch, close to beaches, restaurants, wineries, golf courses and recreation facilities. It is a great location from which to experience the Okanagan. So close to the pool deck you can go out the balcony and call up your kids or other adults to come up for dinner or watch your kids from the balcony while you enjoy some local wine. Closest Golf course is Michealbrook but many more can be accessed by car between 10-50 minutes away. The boat launch is just across the road to access Okanagan lake. Beautiful mountain view just looking out the window. four slice toaster for quicker toasting service. All included, if you require anything extra please ask. A selection of family friendly DVDs are provided. A deck with BBQ and table and chairs for outdoor eating is provided. Nice unit, close to pool. Unit very well stocked and owner is very helpful. I booked a girls weekend away through VRBO. This condo had everything available: from kitchen gadgets to beach towels. We were comfortable in the AC when it got too hot to be on the deck or we cooled off in the pool. The beds were comfortable and we even had coffee and herbs to cook with. A great place to stay, close enough to downtown (10 min by car or an hour walk) and fantastic shops. Don't hesitate to book it. Well kept clean apartment.Lots of extra touches. We would definitely recommend staying there. The unit was well located, very clean and had everything you need for a great stay. Our accommodations were great. Having extras like coffee and condiments was a nice touch. We were there for a family wedding and family were spread out throughout the complex. We found the complex was a maze to great around the first couple of days. Overall a great experience and would recommend to friends and family.